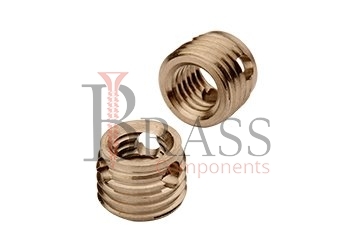 Brass Self-Tapping Inserts are made from Free Machining, Free Cutting, Leaded Brass, 300 Series Stainless Steel or Aluminium which are Passivated and Tested to ASTM Standard. They are available in any metric or imperial sizes as per custom specification. Self-Tapping Inserts are tapered at the bottom and have a cutting slot. By screwing in they cut their own threads inside a receiver hole. Guarantees a completely secure and firm anchoring in the host material. The Self-Tapping inserts with cutting slot spring slightly inwards in the slot region in some materials. This results in a screw locking effect. If this is not desired, we recommend the threaded inserts with a cutting bore. Single Piece, Precision turned parts with both external and internal metric threads. Provide high strength, wear free, vibration resistant screw connection in materials with low shear strength such as aluminium and aluminium alloys, brass, bronze, cast iron and thermoplastics. Self-Tapping Threaded inserts with cutting slot are tapered at the bottom and by screwing in they cut their own threads inside a receiver hole. Slots provide Rapid Cutting Action. Friction between the insert and the plastic permanently holds it in place after installation. Meet RoHS Requirement and UL Listed. Suitable for creating heavy duty, wear resistant and vibration proof fastening in materials. Eliminate the need for close tolerance holes required for tapping into the base material, damaged tools and low productivity. Installs easily into thermoset or thermoplastic materials. Suitable for applications where jack-out is unavoidable. For Self-Tapping Installation and Superior Holding Power. We manufacture Self-Tapping Inserts as per Custom Specification and export in Germany, Spain, Netherlands, Portugal, UK and other European Countries. For more Information, Please Contact Us or Inquiry Now.